Las Vegas will be forever the casino capital of the world. The city was instrumental in laying the foundation of the casinos as we know them today. Vegas is a top destination for many gamblers across the world who visit the place to try out their luck. Fortunes are made overnight here, or one ends up with a learning experience but win or lose, you are surely bound to have a good time in the original sin city. Las Vegas has also drawn inspiration both within the entertainment as well as the gaming industry. Many movies, as well as games, have been made about Vegas over the years. The casino slot making industry is no stranger to the theme. There have been a great many titles made about sin city over the years, each presenting their own views and renditions about the place. 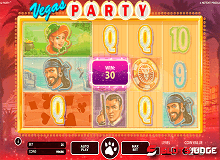 Vegas Party slot is one such creation by Netent on the original sin city. The game will take you amidst all the glitz and glamour of this place, and what’s better, it will even provide you with big wins. The backdrop of the production has been set in a tropical setting covered in a reddish haze creating a semi-transparent effect of the city. You will come across palm trees as well a view of Vegas in the background. 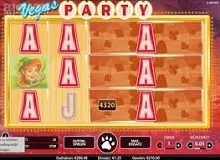 Even the symbols within Vegas Party slot will leave you astonished. Why? For starters, you have James Bond, Cleopatra, Irish leprechauns, the Joker as well as pirates. The upbeat background score perfectly complements the entire setting of the production. 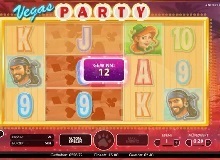 Scatters: There is no scatter symbol within Vegas Party slot game. Wilds: The jester lady is the wild symbol within the game and can substitute for all the other symbols except for bonus and scatters. This shows up on the 2nd, 3rd,4th and 5th reel. Getting two or more wilds can give you big wins. Free spins: There are as such no free spins round within the title. Twin spins: The title has a joint reel feature combination which implies that with every spin, at least two reels join together to expand the reels. More than often players will come across two reels but there are plenty of chances to get three, four and five consecutive linked reels. For a game boasting of 243 ways to win, this is a handy feature for the gamblers providing with a chance to hit the jackpot of 1000 coins. Gamblers can play Vegas Party slot machine online on a number of different casinos online today. The past decade has seen an increase in the number of online casinos providing an avenue for players to try their luck. As this is a production with 243 ways to win, one ought to try and capitalize on the twin spins feature which can provide big wins. There are as such no bonus, scatters or free spins round to boast of. There are no other tips, cheats or strategy here and this by far remains the best chance for players to earn money. 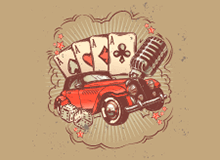 One can play Vegas Party slot for real money as well as for free on a number of online casinos. Most of the casinos today provide a different kind of offers to woo customers to their portal. All you need to do is register and deposit money to start playing. Vegas Party slot is a medium volatility slot with a simple gameplay that will be loved by both amateurs as well as pro players.